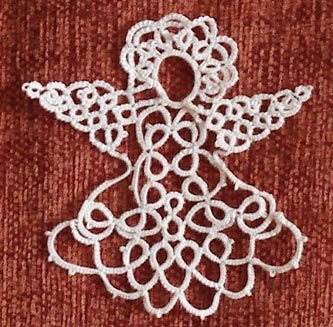 I love days like this: I'm preparing my post (re-reading comments, making pictures...) and Mr Postman rings the bell with my tatting order. tatting.co.uk is Tatting and design, and once again I got my order in something like 24h. Annie, I really think you should give tatting a try. I don't think speed is a major element for a craft. I know I tat slowly compared to the experts (they have video demos on You Tube, that's how I know!) I would focus on the joy of learning a new technique, and the end result you want to acheive. Plus speed comes with practice. Seeing these videos made me realise that by just looking at the diagrams my technique was slow and inelegant. So I forced myself to do something more like in the videos, tatting extremely slowly at first, and now, I'm faster than ever before !!! To your other question: yes, I always line my pouches and bags.As I use thin fat quarters, I think it's essential to have at least a double layer !!! basically, the pouches are 4 rectangles of fabric, with the zipper encased in them. I don't do a special lining before hand. Sinon hier j'ai fait 2 flocons de neige, le deuxieme est un gros rattage par rapport au modele, (il faudrait 6 branches plutot que 5) mais j'ai reussi a faire un quelque chose quand meme. Problem is, it's a bit bulky to put in my hand bag. So I decided to make a little pouch of my own. Then my mind kept on going... 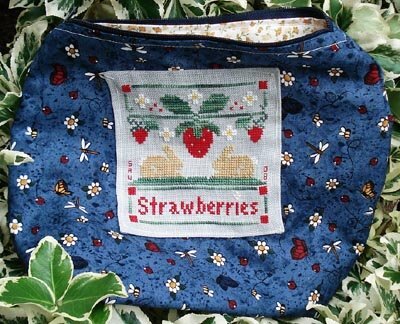 If I put stitching on my cross stitch pouches, why wouldn't I put tatted motifs on this one? The dragon was fiddly to do, with all the twists... and to be honnest, I really had to sew it on fabric so that it keeps its shape !!! 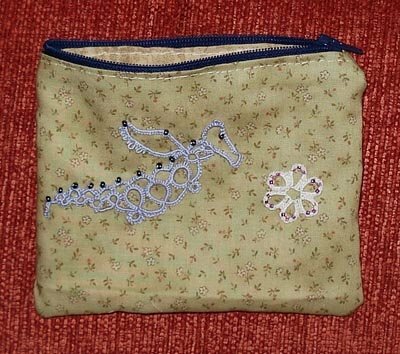 No tutorial for the pouch yet, as I started with "I will build the pouch (cut fabric, pin down) and sew the dragon so I can take a picture", and ended with a pounch entirely hand sewn. You know how it is, you're in the lounge, you keep your hands busy while DBF is talking and the tv is on.... and the pouch is finished before you realise it !!!! Et evidemment, si je mets des broderies sur mes pochettes de broderie, il etait logique de mettre des motifs de frivolite sur cette pochette-ci !!! De toute facon, ce dragon ne tiendrait pas tout seul s'il n'etait pas cousu, il y a tant de torsions !!!! J'ai encore oublie le tuto... Car au depart, je ne pensais pas faire la pochette en entier. Je voulais juste coudre le dragon pour que je puisse faire la photo pour le blog. Mais j'ai voulu batir, puis au fur et a mesure, la pochette etait entierement cousue... a la main !!! 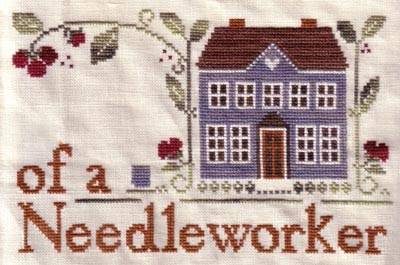 Thank you so much for comments on Home of a Needle worker... you are too kind to ignore the mistakes I made !!!! Yesterday i progressed on "Busy Needle", but today I will show you my tatted star. It took 2 days to make. I used some blue/white variegated thread size 5 or 8 I had in my stash. Because of the thickness of the thread, it's quite big: bigger thant he palm of my hand. Merci pour les commentaires sur "Home..", c'est gentil d'ignorer mes erreurs !!! Sinon, j'avais trouve un yahoo group pour la frivolite, mais il y a eu une guerre et maintenant la liste va etre fermee... c'est vraiment pas de pot !!! 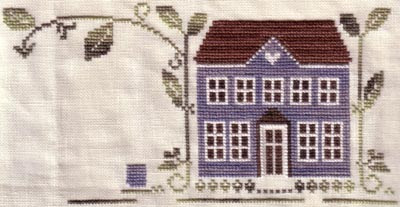 Home of a needleworker finished ! Voici le "Home" fini ! Je dois avouer qu'on peut jouer au jeu des 7 erreurs avec la bordure du haut, mais je n'ai pas eu le courage de tout defaire si pres de la fin !!!! Et j'avoue que je ne sais pas trop quoi en faire pour l'instant: cadre? sac? coussin? hum..... C'est tellement beau que j'ai envie de le mettre a l'honneur, mais comment? Par contre, le "Busy Needle" que j'ai commence hier soir a deja pour vocation d'etre une nouvelle.... trousse ! Home of a needleworker is finished, even if the top border has mistakes I didn't feel like frogging so close to the end !!! Voici l'ange que j'ai commence mercredi soir... Ca m'a pris quasi la journee pour le faire, avec une pause broderie entre deux. Ca a aussi demande une grande quantite de fil, et je suis contente de savoir enfin cacher les debuts et fins de fils, sinon ce projet serait totalement cracra. 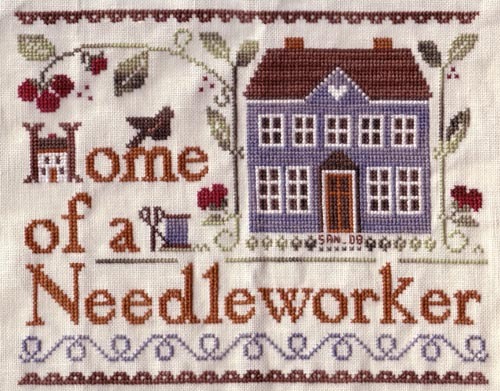 Donc j'ai aussi fini la partie centrale de "Home of a Needleworker", il ne manque que la bordure !!!! Here is the tatted angel I started on Wednesday. It took me most of yesterday, with just a stitching break, and loads of thread to make it. But I'm glad I now know how to hide beginnings and ends of threads. Otherwise it would have looked terrible. Voici mon premier truc qui n'est pas une fleur en frivolite... c'est une sorte de mini napperon ovale. 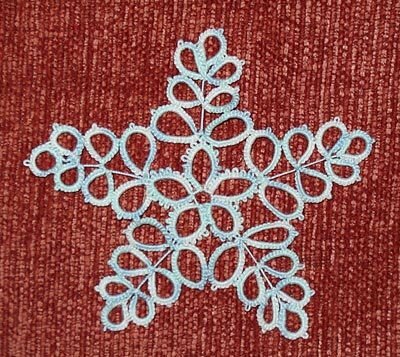 Je ne maitrise pas encore bien les distances on dirait, mais je pense quand bloquant l'oeuvre ca devrait etre ok.
Mardi j'ai commande 3 bouquins sur Amazon, Christmas Angels and Other Tatting Patterns (Dover Needlework) , Tatted Snowflakes (Dover Needlework) et Easy Tatting (Dover Needlework) sur Amazon. C'etait pas cher, et c'est arrive hier matin, c'est plus rapide que La Redoute (24h chrono). Et il y a tellement de beaux modeles que je vais avoir besoin de beaucoup plus de temps pour tout faire !!! 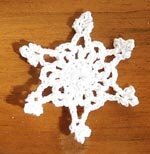 Here is the first non-flower I made in tatting. It's a bit crooked, but with blocking it should be fine. Dans les temps anciens, les dames avaient toujours sur elles un ouvrage pour patienter en cas d'attente... Et la frivolite etait la technique certainement la plus pratique pour ca, comme j'ai pu l'experimenter hier ! Car hier etait le premier beau jour de juillet,malgre le vent a decorner les boeufs. Nous voila en vadrouille, et nous avons meme ete dans les bois, ce qui n'etait pas vraiment prevu. J'ai aussi brode, ben oui, je me rapproche de la fin de Home of a needleworker, qui est super a faire, surtout quand on veut des trucs simples !!! 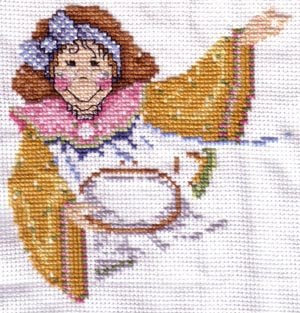 In old days, ladies always had some needlework on them in case they had to wait some place. And tatting was the perfect technique. I experimented that yesterday. 2 shuttles, a hook and scissors fit perfectly in a handbag. Yesterday we wandered in the sun, and in the woods, and I was able to finish the little thing on the right, and make an extra flower (middle). I realise I haven't done much yet, but tatting is a difficult technique. See, Ginnie, Ginny and Annie, you are not the only ones with problems with tatting ! 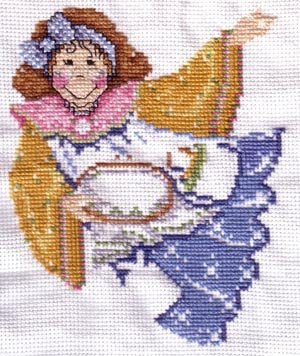 I was so slow to start with, but now, I'm sort of ok... Ginny, what does your daughter make in tatting? Annie, thank you for the link, I already bloglined it, Wendy makes great things indeed ! Lors de mon surf dans les blogs hier soir, je suis tombe sur des blogs de frivolite, ou tatting en anglais. Voila une technique que j'ai essayee plusieures fois mais sans grand succes, surtout que je n'en voyais pas trop l'utilite, surtout que niveau dentelle (double emploi avec le crochet), et ca donne un aspect assez etrange. Sans parler du "tour de main" difficile a avoir, surtout quand on essaye tout seul face au bouquin !!!! Et donc voici mes premiers essais, de gauche a droite par ordre chronologique. - 2, 3 et 4 ont donc les fils coupes au ras du noeud, et evidemment ca se defait ! 2 et 3 sont des essais similaires mais toujours avec des sections tournicotees bizarre. 4 est un essai a 2 navettes commence il y a bien longtemps. Yesterday I found tatting websites, and I had to give it a try (again). I have everything, and even some old ivory shuttles from I don't know where, but as I crochet, it felt a bit as a difficult cousin. - 5 is a test with beads... Nothing wrong with the technique here, and I found a great way to weave thread ends on a website, so... perfect ! Nath, je ne sais pas ce que c'est Maxicino chocolat??? A propos de la trousse... Hum.... Je n'ai pas utilise de modele pour la faire, et je n'ai pas vu d'autres personnes sur le web qui coud la tirette au centre des deux tissus... Et encore moins avec des pochettes interieures ! C'est juste venu comme ca, par experience... Et evidemment j'ai encore oublie de faire des photos pour un tuto. Il faut donc que je refasse une autre trousse !!! About the pouch... 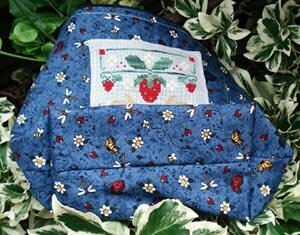 I don't use any pattern to make my pouches. It just came as I was making them. I have to say I haven't seen anybody sewing the zipper in the middle of the fabrics like I do, or making inner pockets. I know I still haven't made a tutorial for it... and you know what that means... I need to make yet another pouch !!! Apres avoir attendu presque 2 mois, j'ai enfin fait ma pochette avec les lapins !!! Un tissu plutot estival cette fois, et cette pochette est assez grande, avec un fond rectangulaire, et des pochettes a l'interieur pour que ce soit plus fignole (photos plus bas). Je pensais que avec un fond rectangulaire, ce serait plus adequat pour les ouvrages au crochet, qui ont des pelottes, et donc plus de volume. Comme vous l'avez surement remarque, j'ai mis le francais en premier aujourd'hui. J'avais dans l'idee d'inverser les langues, avec mon retour en pays francophones. A moins que, dans un esprit egalitaire, je change l'ordre des langues de temps en temps, mais ne serait-ce pas plein de confusion pour tous? I finally made the bunnies pouch. This time it's big, with inner pockets and a squared bottom, mostly to accomodate crochet projects using balls of threads. I'm glad my little experiments with overdyed interest you. It's quite fun to do. DBF says I'm missing experiments in the lab, and I compensate with experimenting int he kitchen, and believe me, he doesn't complain about my little cakes !!!! And I experimented with "by row" vs " "by stitch" with those lovely Crescent Colours overdyed threads. It all started when Kim told me that she was always stitching by row of half crosses with overdyed, and I was very surprised because the lovely cushion she made made a few years back with 2 friends all in overdyed was nicely variegated. 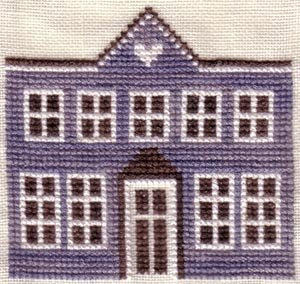 So here, you can see the blue of the house not so much variegated, stitch by stitch, while the roof is by row, but has nice variations. Of course the variations of the blue thread is more subtle in nature, but overall... You can use either way of stitching, and you still get nice results. Well, I'm busy here and there, so... no time to be on the net, reading or posting ! 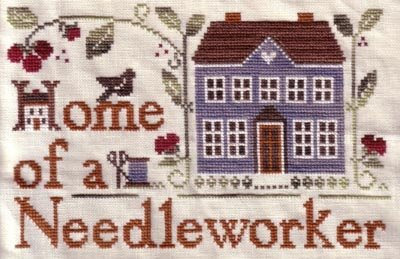 Anyway, here is my home of a needleworker growing nicely. I'm back to LHN patterns... and I have a break from the fairy. The weather is grey and not so nice, but warm... weird ! Je suis tellement occupee a gauche a droite que je ne fais que rarement de l'internet, et quand j'ai du temps, je brode plutot que d'etre sur l'ordi. Alors voila la "home of a needleworker", qui avance (je suis en phase LHN en ce moment), et le napperon est a son avant dernier tour. Le temps est gris et chaud, c'est tres bizarre ! 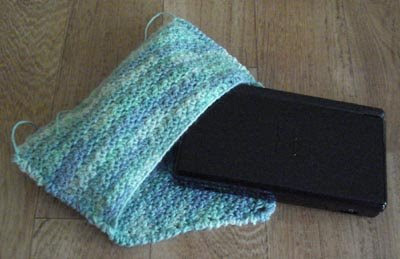 The second picture is the Nintendo DS pouch, the threads still need to be sewn in, and it needs a clasp to close. I'm afraid I might have made it a little too small... but well, it's better than too big. It's a Senseo harlequin thread, using an alternation of single and double stitches, and I think the effect is lovely. Another thing I tried is making cookies. Simple biscuits really. I found my cooking books and just wanted to try... This is my second batch, a lot better than the first one, where the cookies are now a bit hard. Summer has left us, and it's pouring rain most of the time. I guess the plants love it. But it's not nice to be out. Today DBF is coming for the summer, and it will probably be the only time in my life (until retirement) that I will have such long holidays. 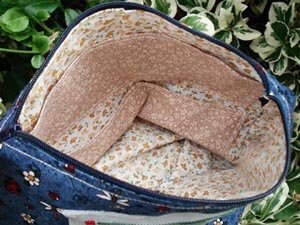 - pochette fleur en tissu du bouquin Omyage. Donc la fee en point de croix n'avance pas vraiment, je n'ai fait que du vert, et du bleu dans la robe. Pour le moment je ne suis pas inspiree par le point de croix, je me demande a quoi ca sert, et donc je laisse tomber tres vite. 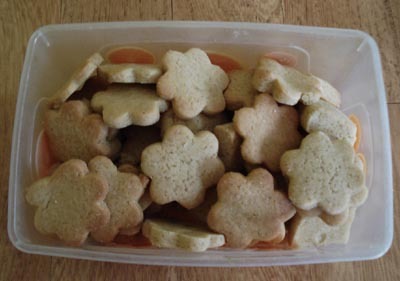 J'ai aussi retrouve des livres de recettes, et j'ai essaye de faire des biscuits. La photo montre ma deuxieme tentative, qui est mieux que la premiere (moins casse dents). Ici l'ete est deja parti, et il pleut tres souvent. Pas ideal pour sortir. Aujourd'hui DBF arrive, et ce sera surement la seule fois ou on aura autant de temps de vacances avant la retraite ! And he has a "I look a bit sad so I can be even cuter" look. 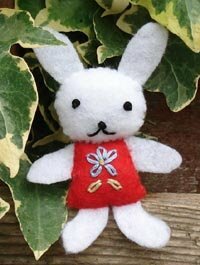 Size wise, he's just a bit smaller than the picture, so yes, it was fiddly to do ! I'm in crochet mode, and DBF has decided to call me "La fee Crochette" (Tinkerbell = Fee Clochette, so crocheting fairy). I ordered (and received) 2 Easy touch Clover hooks, as shown inthe second picture, and they are a lot more comfortable to use. 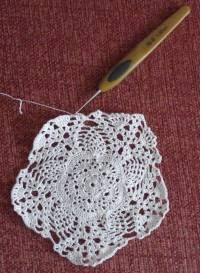 I'm now making a doily. The picture shows the progress, and it's only half the finished size. 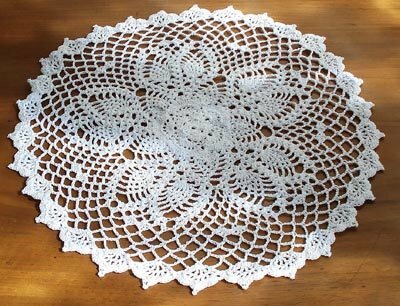 I can't help it, I love making doilies, even if I don't like displaying them in my house. But I figured I can still give it to grandma. Il adopte l'air "je suis un peu malheureux pour que vous me trouviez encore plus mignon". Je suis totalement dans ma periode crochet, et DBF m'a rebaptisee "La fee Crochette". En ce moment, je fais le napperon de la photo (crochet 1mm, fil 20, pour l'instant la moitie de la taille finale). J'ai achete le crochet aussi sur la photo, un Easy touch Clover, qui est beaucoup plus confortable que les crochets standards. To people on the American continent: Happy 4th of July ! Here, and especially in France, we celebrate the liberation of Ingrid de Betancourt, and it's an amazing thing, a testimony that happy endings can happen. Sometimes. I also spent a lot of time reading, my book at the moment is "Divas don't knit". Why is it always about knitting? Where are all the stitchers out there? Personellement, j'ai repris mon crochet, et je suis lente a faire un petit amigurumi... La broderie pendant ce temps est quasi inexistante, meme si la fee est desormais en position pour broder avec ses mains et son tambour. Je passe beaucoup de temps a lire, et en ce moment c'est "Divas don't knit", sur des tricoteuses... Mais pourquoi un tel engouement pour le tricot? Ou sont les brodeuses? Le temps ici est soit orageux soit tres chaud, donc je suis contente de n'avoir pas a travailler ! I was going through my craft books and found my copy of "The Cute book". I bought it a while ago in Borders London, but never made anything out of it. 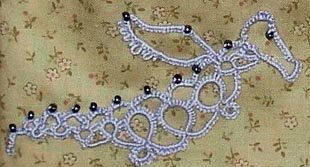 I spent some time today trying to figure out bobbin lace patterns without succes, tried a few basic things, had a bit of "why would I make lace for? ", so I guess I needed something simple to compensate. En triant mes bouquins hier, je suis tombee sur "The cute book", que j'ai achete il y a longtemps a Londres. 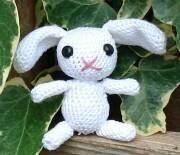 Et evidemment j'ai eu envie de faire le petit lapin !